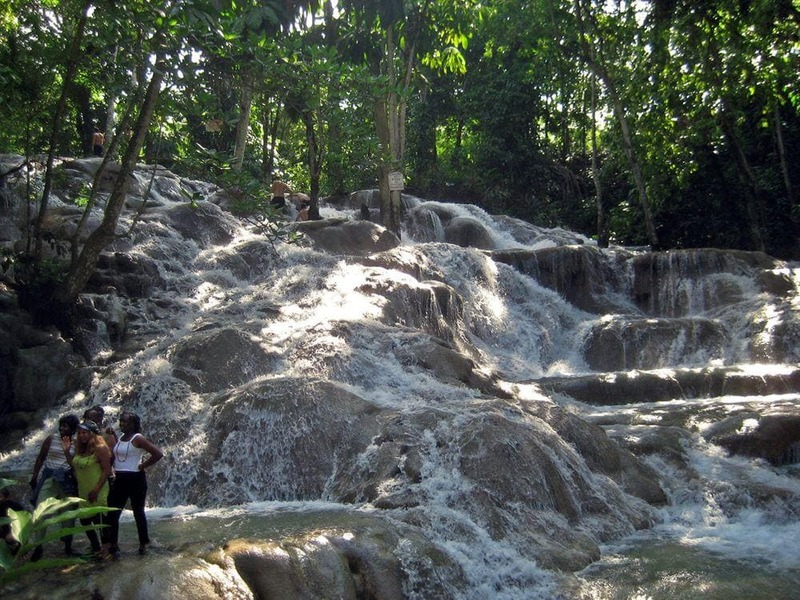 One of the most exciting natural landmarks in Jamaica is Dunn’s River Falls. This is not just a waterfall – this is a set of tufa terraces formed by springs and ending directly into the Caribbean Sea. Jamaica has limestone formations and humid, tropical climate. This is a recipe for exciting geological process – karst. Rainwater seeps through the small fractures in the limestone and dissolves the lime on its way. Fractures in the rock become larger turning intounderground streams and caves. There are rather many places in Jamaica where such underground streams come to the surface. Such springs are called river rises or resurgences. Water, which leaves the limestone and comes to the surface and open air, precipitates the dissolved lime. Thus along the spring bed and river stream is precipitated light colored material – tufa. The precipitation and characteristics of the stream often cause another phenomenon – tufa terraces. These terraces look like shallow basins in rock. When water reaches the rim of this basin, it falls down along a small waterfall into the next pan. Such tufa waterfalls are not very frequent in the world but not that rare either – tufa and travertine terraces could be found in more than 100 places around the world. Their formation continues while the springs are active. 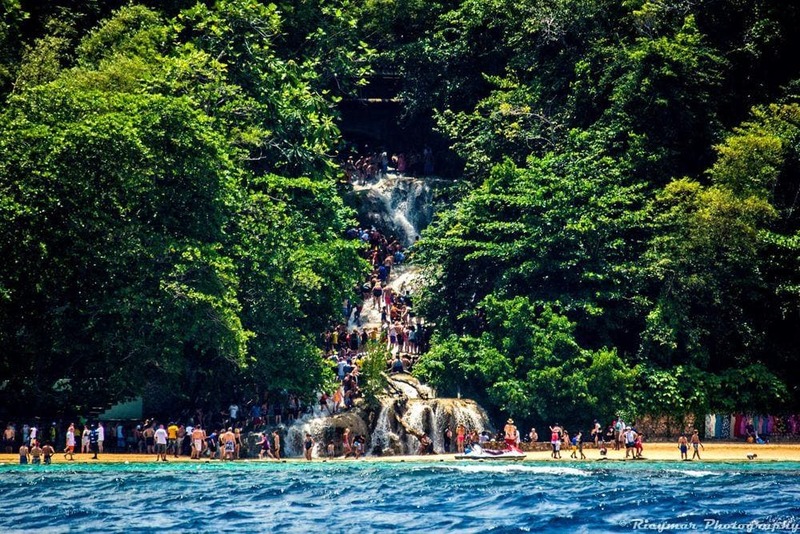 Typical example of such processes is Dunn’s River Falls in Jamaica. World has many staircases and many are beautiful. 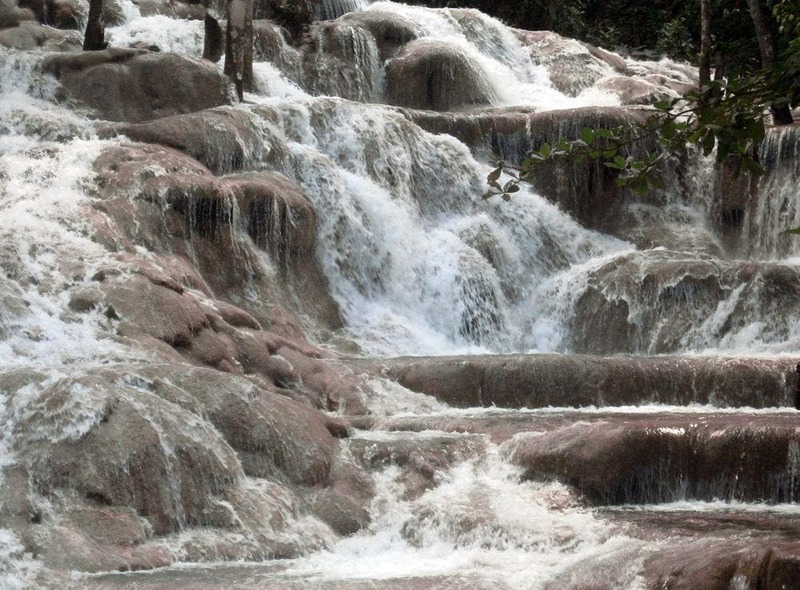 But Dunn’s River Falls could be some of the most enjoyable staircases in the world. These tufa terraces end in the beach of Caribbean Sea. Thus – one can start climbing them right from the gorgeous beach. 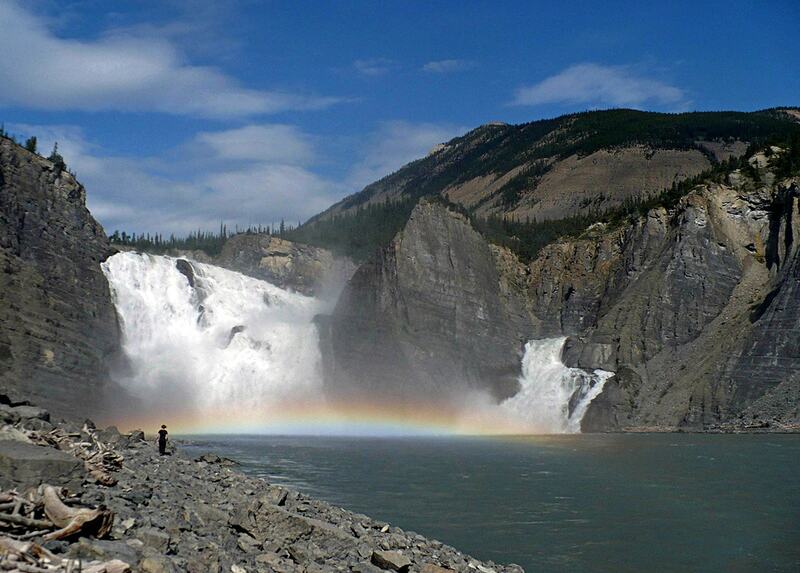 Water in the falls is pleasant and tropical vegetation creates likeable shadow. Visitors to the site can climb for a while – and stop for a short bath in one of the pools along the way. Total height of waterfall terraces is roughly 55 m, length of the falls – more than 180 m.
No wonder that this place is much enjoyed both by local people and numerous tourists. Falls have played a role also in the history. 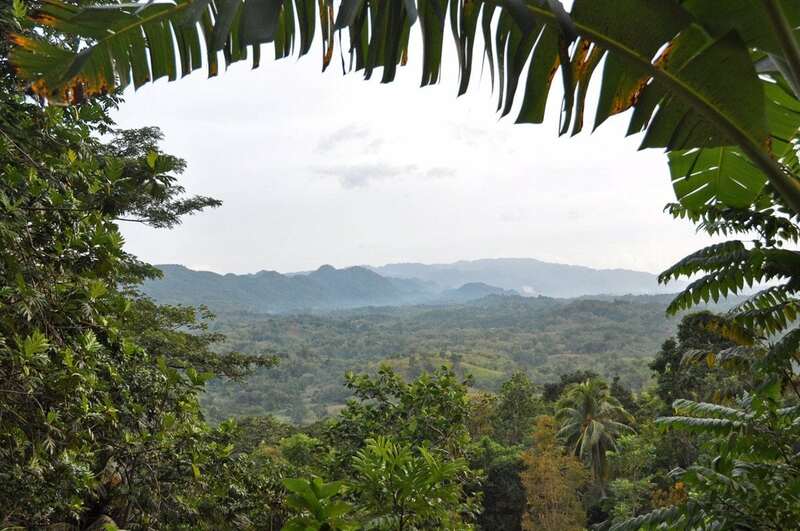 It is possible that exactly here took place the decisive battle about Jamaica ("Las Chorreras") between the English and Spanish in 1657. English won – and since then Jamaica became an English speaking country. Falls were recorded in the very first James Bond movie – "Dr. No" (1962). In fact this is one of the most memorable moments of these movies – seducing Honey Ryder (played by Ursula Andress) walks out of the sea right at the falls and meets James Bond here. In 1972 this area was obtained by the government of Jamaica and turned into tourist resort with international fame. Since then Dunn’s River Falls have turned into tourist trademark of this beautiful island. 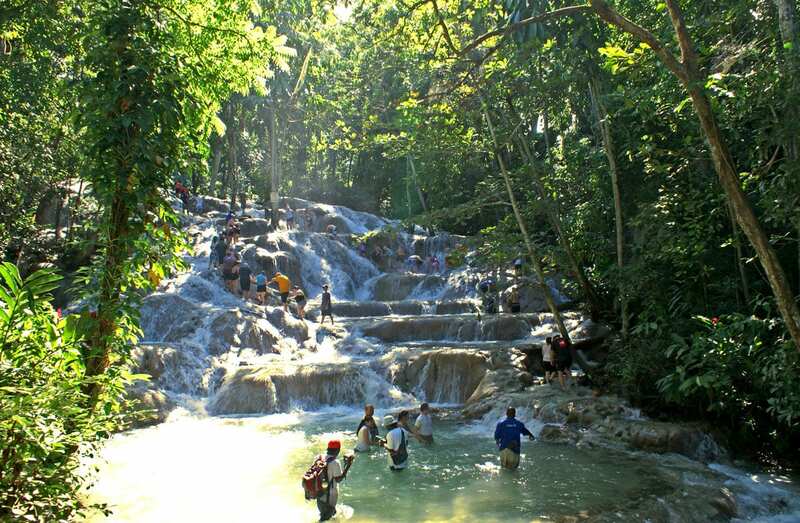 Jamaica is the third largest Caribbean island with distinct local culture and amazing nature. Highlights of Jamaica are unique ecosystems as well as caves and sinkholes. Come to Jamaica for its tropical climate and calm Caribbean waters; stay to explore the heart of its vibrant culture and spirit with Moon Jamaica! Waterfalls of Jamaica will be of interest to academic geographers, tourism planners and environmentalists, as well as to Jamaican residents and visitors to the island, whose enjoyment of the landscape will be enhanced by their reading of this volume. A special section provides hints for photographing various waterfalls to best advantage, which should prove valuable to amateur and professional photographers alike.